Saucy Garlic Parmesan Chicken Wings | What's Cooking at the Genua's? Well it has been much longer than I had anticipated for posting a new recipe. But as we all know, life can get pretty busy sometimes. But it’s no excuse. I have so many recipes I need to post so I’m starting with the one I made just last night. I posted the photo on Facebook and had a few requests for the recipe so here it is. 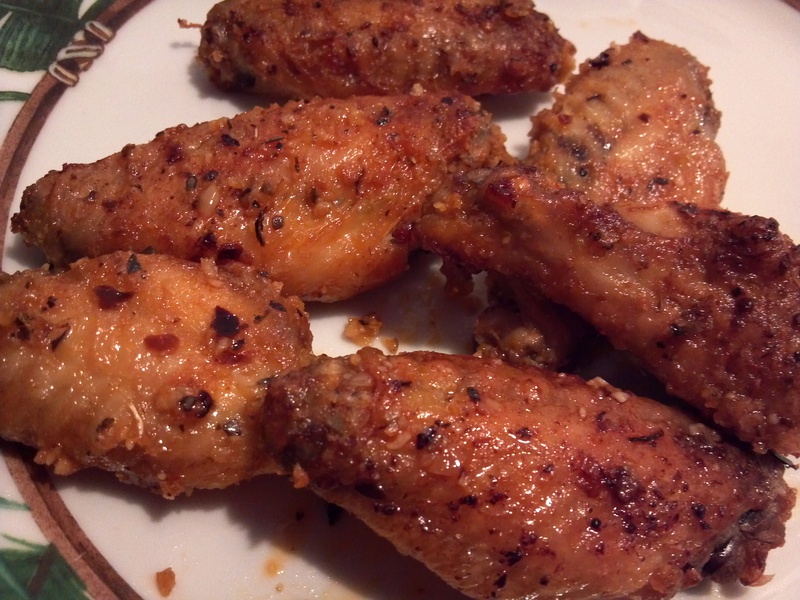 This recipe started out with me making my Buttery Garlic Parmesan Chicken Wings. Then I thought maybe I should try something slightly different. I had a bit of marinara sauce in the fridge, really it was only about 2 ounces, but I figured it would come in handy and it did. I added it to my recipe and tweaked it a bit and came up with a new flavor. They were delicious. No leftovers here! Quick note about the chicken wings I use. In the past I have bought Tyson uncooked wings or Perdue. But they can be very pricey. Then I switched to Great Value (Walmart). Not bad. But now I am using only the wings I have purchased at a store we just discovered, Save-a-lot. A 4 lb bag costs about $6.00! And the wings are huge! Most of the other brands were have the size for more money! And they are delicious! 2 ounces marinara sauce or whatever red sauce you may have around. Plain tomato sauce is good too. On a large cookie sheet or shallow roasting pan lay out the wings. They can touch and crowd each other because they do shrink a little. Place in oven and bake for 30-45 minutes for frozen. Flip every 10-15 minutes or so. If using thawed, reduce cook time. Bake to desired crispness. Meanwhile in a food processor place garlic, olive oil, basil and oregano. Pulse until garlic is finely minced. Add butter to small saucepan and melt on low heat (careful not to burn). When melted add the garlic mixture and red pepper flakes and cook till heated. Add the cheese to the garlic mixture and add to the wings in bowl. Mix thoroughly. 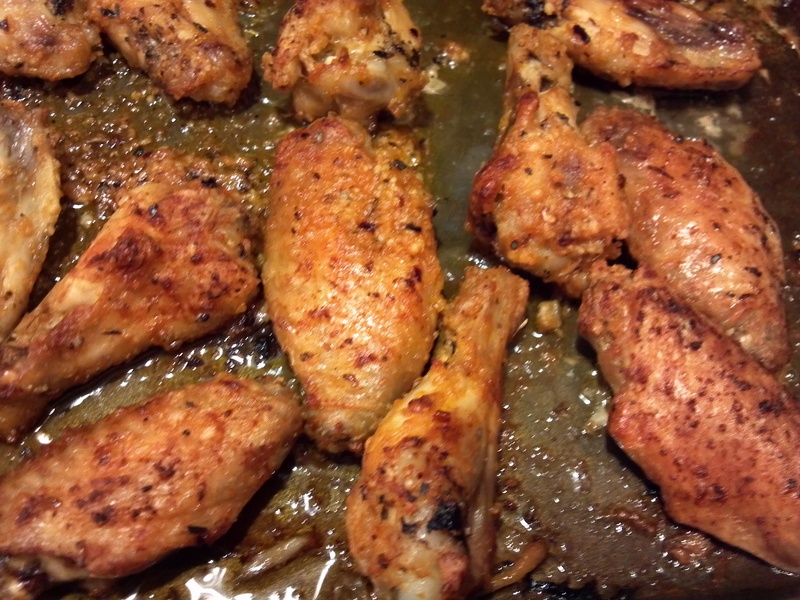 Return wings to pan, sauce and all and bake another 5-10 minutes but keep an eye on it. You don’t want all the sauce to dry up. Return to bowl you mixed them in and serve. Or if you want a pretty presentation put on a platter. Serve with bleu cheese and celery/carrot sticks! And everything is better with an Italian edge to them!